Located 30 miles southeast of Pittsburgh, Greensburg is a major business, academic, tourism and cultural center in Western Pennsylvania. It is evident as the city's population doubles during work hours. The city ranks seventh in Pennsylvania in daytime growth, behind Pittsburgh, Philadelphia, Harrisburg, King of Prussia, Lancaster, and State College. 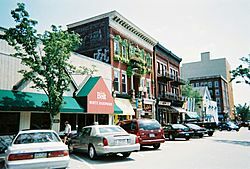 It also ranks 16th in the United States for daytime growth among towns with a resident population between 15,000 and 24,999. In 2007, Greensburg was ranked as one of the "Best Places to Retire" in Pennsylvania by U.S. News & World Report. After the end of the Revolutionary War, an inn was built along a wagon trail that stretched from Philadelphia west over the Appalachian Mountains to Fort Pitt, now the city of Pittsburgh. A tiny settlement known as Newtown grew around the inn, today the center of Greensburg's Business District at the intersection of Pittsburgh and Main Streets. At Pittsburgh, the wagon trail became Penn Avenue. In 1782, a raid by Guyasuta-led Seneca Indians accompanied by Canadian rangers burned Hannastown, the original Westmoreland County seat, north of Greensburg, and the first county seat west of the Allegheny Mountains. Newtown became the new county seat in 1785. In 1786, the county built a log courthouse on land purchased from two residents, Christopher Truby and William Jack. The Westmoreland County Courthouse, in its various incarnations, has stood on this site. The area surrounding the courthouse became the original borough of Greensburg, named for American Revolutionary War General Nathanael Greene, and formally incorporated as a borough in 1799. In the early 19th century, Greensburg had very little growth. After 1850, Greensburg became a growing county seat with inns and small businesses. It was a railroad stop and the discovery of large areas of soft coal nearby made it the center of a vigorous mining industry in the late 19th century and early 20th century. Seton Hill College, formerly St. Joseph's Academy, became a four-year women's institution in 1918. Greensburg became a Third-Class City on January 2, 1928. After World War II, more residential areas were developed in various sections of town. 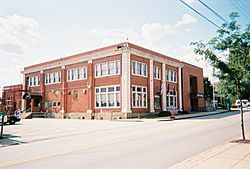 Greensburg's cultural status grew as the Westmoreland County Museum of Art opened in 1959 and the University of Pittsburgh founded the branch campus, University of Pittsburgh at Greensburg, in 1963, now located in Hempfield Township. The opening of Greengate Mall and Westmoreland Mall in 1965 and 1977, respectively, marked a new era for retail shopping in the area, but negatively impacted retail businesses in Downtown Greensburg's shopping district. Changes in local shopping habits had already taken its toll by the late 1970s when Troutman's Department Store closed. By the mid-1990s, city officials shifted its revitalization plans on the cultural aspects of Downtown Greensburg, such as the restorations of the Palace Theater and the historic Train Station, as well as a new, recently opened performing arts center for Seton Hill University. Also, in July 2009, Lake Erie College of Osteopathic Medicine, the largest medical school in the country, opened a satellite campus at Seton Hill University. Now over 200 students study at LECOM at Seton Hill every year. As part of this ongoing transition, an expansion of the Westmoreland Museum of American Art was completed in 2015. The city is home of the Roman Catholic Diocese of Greensburg. Greensburg's first log school house was located at the site of St. Clair Park. St. Clair Park was originally a cemetery. When the borough banned cemeteries, St. Clair cemetery was moved to its current location, just east of town. Mt. Odin Park was originally the estate of Dr. Frank Cowan, attorney, physician, author and former Secretary to President Andrew Johnson. Dr. Cowan willed his land to Greensburg to be used for recreational purposes. The city of Greensburg is currently composed of eight wards, most of which were formerly boroughs and are divided into several neighborhoods. Bunker Hill, now Fifth Ward, was merged into Greensburg in 1894. The name originated because of fights at the rowdy Bushfield Tavern in the early 1840s to mid-19th century that were compared to the Battle of Bunker Hill. In 1905, Greensburg absorbed three adjacent boroughs, including Ludwick, now Sixth Ward, which was named for Ludwick Otterman, an early settler for whom the street is also named, as well as East Greensburg, now Seventh Ward, and Southeast Greensburg, unofficially known as Paradise (Eighth Ward). South Maple Avenue was originally named Kinderhook (Third Ward). Second Ward, located north of Downtown Greensburg, is the largest ward and includes the neighborhoods of Saybrook Village, Evergreen Hill, New Salem Acres, Country Club Meadows, Northmont, Devonshire Heights, Rose Fountain Farms and Academy Hill. Hilltop, a neighborhood in Eighth Ward, was originally settled by Italian immigrants and borders South Greensburg and Underwood on either side. First Ward features Chestnut Hill and Shuey Plan, and is also home to Seton Hill University. Other Greensburg neighborhoods include Eastern Estates, Underwood, Shogan and Hillcrest. Eighth Ward was originally home to many Italian immigrants from Cercemaggiore, Italy. Today, the original Our Lady of Grace church, built by the masons from Italy, still stands although used as a residence. The Hilltop Social Club, founded by a few families who lived in the areas of Bierer, Margaret, White and Catherine Streets is also located here. Every year it has become a tradition for the firehall in the Eighth Ward to throw a carnival which includes bingo, amusement rides, and of course the famous Shuey Burgers. Two neighborhoods have been designated as U.S. historic districts, the Greensburg Downtown Historic District and the Academy Hill Historic District. Also listed on the National Register of Historic Places are the Greensburg Railroad Station and Westmoreland County Courthouse. As of the census of 2000, there were 15,889 people, 7,144 households, and 3,922 families residing in the city. The population density was 3,746.1 people per square mile (1,446.9/km²). There were 7,734 housing units at an average density of 1,823.4 per square mile (704.3/km²). The racial makeup of the city was 93.43% White, 3.91% African American, 0.09% Native American, 0.70% Asian, 0.01% Pacific Islander, 0.38% from other races, and 1.47% from two or more races. Hispanic or Latino of any race were 1.08% of the population. There were 7,144 households out of which 24.1% had children under the age of 18 living with them, 39.3% were married couples living together, 12.8% had a female householder with no husband present, and 45.1% were non-families. 39.2% of all households were made up of individuals and 15.4% had someone living alone who was 65 years of age or older. The average household size was 2.11 and the average family size was 2.85. In the city the age distribution of the population shows 20.2% under the age of 18, 10.0% from 18 to 24, 27.9% from 25 to 44, 22.6% from 45 to 64, and 19.3% who were 65 years of age or older. The median age was 39 years. For every 100 females there were 81.7 males. For every 100 females age 18 and over, there were 76.1 males. The median income for a household in the city was $30,324, and the median income for a family was $41,112. Males had a median income of $33,306 versus $24,246 for females. The per capita income for the city was $18,312. About 10.8% of families and 13.6% of the population were below the poverty line, including 18.1% of those under age 18 and 11.9% of those age 65 or over. 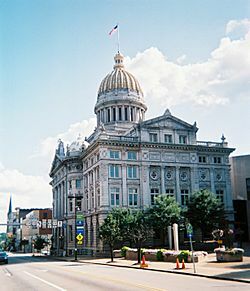 Greensburg is a major cultural center in Western Pennsylvania. It is the home of the Westmoreland Museum of American Art, which specializes in American Art circa 1750–1950. The Palace Theatre, in the heart of the city's emerging cultural district, is the site for various performances throughout the year. Additionally, it is the home of the Westmoreland Symphony Orchestra, and the Summer Sounds Concert Series at the Robertshaw Amphitheater in St. Clair Park. The Westmoreland Cultural Trust has played a major role in the revitalization of Downtown Greensburg in recent years. Its accomplishments include the ongoing renovation of the Palace Theatre and the restoration (Before/After Pictures) of the circa 1910 Train Station. They are also responsible for renovating several commercial buildings in the downtown area. Stage Right! also contributes to the culture of the region, offering classes in musical theatre for young people and staging professional productions at the Palace Theater and Greensburg Garden and Civic Center. Greensburg Civic Theatre, one of the few long-established volunteer-based community theatre organizations in Westmoreland County, has been presenting both adult and children's theater productions for over 60 years. Founded in 1951, they are the resident theatre company at the Greensburg Garden and Civic Center. The Performance Arts Center of Seton Hill University opened its doors to the public in September 2009. This multimillion-dollar complex, located in the city's Cultural District, is expected to serve as an additional catalyst for the future growth of the downtown core. A hands-on science center, to feature a wide range of interactive exhibits, was proposed for the former Mellon Bank building downtown, but it has since been put on hold indefinitely. Titled the Discovery & Interactive Science Center (DISC), it was to be a regional attraction for Westmoreland, Fayette, Indiana, Somerset and Bedford counties. It would've also been the only interactive science center between the Carnegie Science Center in Pittsburgh and the Harsco Science Center in Harrisburg. Just north of Greensburg is Old Hanna's Town, the first county seat west of the Appalachian Mountains. Greensburg is home to a great deal of interesting architecture including many historic and large homes as well as many old churches and cathedrals. The inner city has many small 1950-style shops and restaurants. The World Conference Center for The Church of Jesus Christ is located west of Greensburg on PA Route 136. It is the third largest branch of the Latter Day Saint movement. 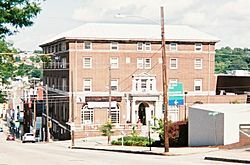 The national headquarters of the Kappa Delta Rho Fraternity is based in Greensburg. The Saint Emma Monastery (founded 1931) is a Roman Catholic retreat house and monastery for the Sisters of Saint Benedict located in Greensburg. Since Greensburg is overshadowed by nearby Pittsburgh, radio and television stations are mostly based out of the larger city. On a much lesser scale, some Johnstown-area media outlets are also available in parts of Greensburg. The following information is about media based exclusively in Greensburg. Greensburg's major newspaper is the Tribune-Review, which is owned by the Tribune Review Publishing Company. In 1992, this company founded the Pittsburgh Tribune Review, a competitor to the Pittsburgh Post-Gazette. This occurred immediately following the demise of the Pittsburgh Press. The Tribune Review Publishing Company was owned by noted philanthropist and conservative figure Richard Mellon Scaife. Since starting the Pittsburgh Tribune Review, the original Tribune Review that circulates in and around Greensburg has upgraded its national and international news coverage but continues to maintain a robust local news section. The Greensburg-based WHJB-FM, branded as Classic Hits 107.1, is a classic hits radio station that was reintroduced to the Greensburg market in January 2006. It was originally whjb-am 620, WOKU-FM, WSSZ-FM, WJJJ-FM and WGSM-FM. 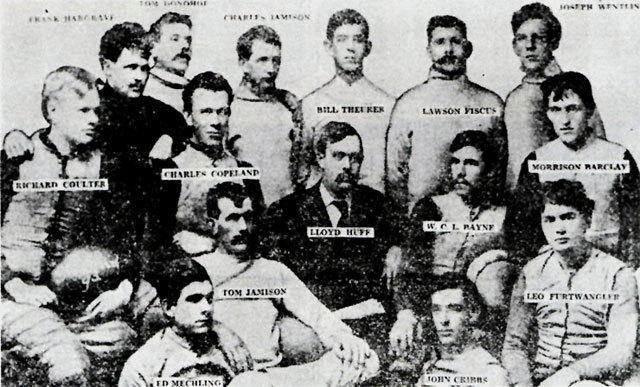 LCS Hockey, a newsletter turned internationally renowned website, was founded in Greensburg. In 2004, Greensburg attorney P. Louis DeRose, published the book, Greensburg through the Arcadia Publishing Images of America Series. In 2006, Greensburg resident Rachel E. Smith, published the book, Greensburg through the Arcadia Publishing Postcard History Series. Mystery novel writer K.C. 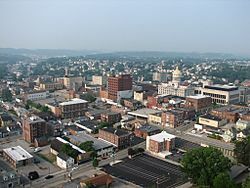 Constantine has used various elements of Greensburg as a basis for the fictional town of Rocksburg in his novels. The east-west U.S Route 30 expressway bypasses Greensburg to the south, as does the north-south Pennsylvania Turnpike 66 to the west. A proposed highway called the Laurel Valley Expressway was initially planned to be built to the east of Greensburg, primarily in Unity, Derry, and Mount Pleasant townships, but that project has never materialized. The Pennsylvania Turnpike's New Stanton exit is about six miles (9 km) south of Greensburg on U.S. Route 119 where Interstate 70 splits from Interstate 76. The Turnpike's Irwin exit is located about seven miles west of the city on U.S. route 30. PA Routes 66 and 136 begin in Greensburg. PA Routes 130, 819 and U.S. Route 119 pass through the city. U.S. Route 22, a major connector from Central to Southwestern Pennsylvania runs approximately seven miles north of the city through Salem Township, accessible by routes 66, 819, and 119. Westmoreland Transit is the mass transit system of Greensburg and Westmoreland County and operates a network of bus routes seven days a week throughout the city and the rest of the county, as well as Pittsburgh. Greyhound Lines runs regular scheduled bus service to and from Greensburg from many hubs, including Pittsburgh, Chicago, and New York City. Air service is available at the Pittsburgh International Airport and at the Arnold Palmer Regional Airport east of Greensburg in nearby Latrobe. 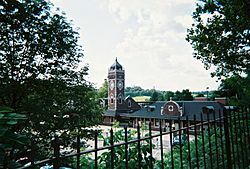 The city has Amtrak rail service at the restored Train Station, as well as freight rail operator Norfolk Southern and an independent shortline railroad connecting coal mines and businesses located south of the city to the Norfolk Southern line just west of Greensburg. Greensburg is bike-friendly as it offers the Five Star Trail, which begins at Lynch Field and ends south of the city in Armbrust. It will eventually connect to the north section of the Youghiogheny River Trail, which is a part of the Great Allegheny Passage. Greensburg, Pennsylvania Facts for Kids. Kiddle Encyclopedia.